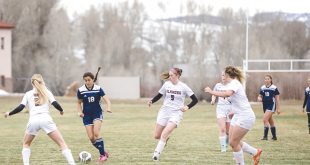 The shortened soccer pre-season, coupled with some experimentation by the coaching staff, had the Crested Butte Titans soccer team on pins and needles heading into their first two games of the 2018 season this past weekend. Typically the team has two weeks, and then some, of workouts to prepare for the season. This year, pre-season was limited to a week and a half, leaving little room for fitness. In addition, the coaches threw in a new game plan at the team. Fortunately for the Titans, some of their initial concerns were laid to rest as they rattled off two wins on the road with a 4-0 win over Cortez on Friday, August 24 and an 8-0 win over Bayfield on Saturday, August 25. “For the most part we kept the intensity up and played well,” says Linehan. The play was erratic from both teams. Cortez was obviously strong up top and looked to play long passes to their strikers, but the Titans’ defense did their part to hold off the attack through the first 10 minutes. The Titans settled in and took control of the midfield with Carlos Franco and Linehan working hard to settle play and establish possession. The effort bore fruit 11 minutes into the game when a foul gave the Titans a direct from 25 yards out and Franco’s shot sailed past the Cortez keeper for a 1-0 lead. The Titans struck again in the 27th minute when Cortez struggled to clear a corner and Jovany Aguirre chased the loose ball down outside the 18-yard box and spun and fired for a 2-0 Titans lead. The Titans maintained the pressure through the first 20 minutes of the second half and notched two more goals as Franco assisted both goals by Linehan for a 4-0 lead. Up 4-0 and lacking fitness, the Titans started to crack a little. Defenders Tate Young, Zane Reda, Finn Smith and Nathan Miller made the difference though to hold off Cortez and the Titans sealed the 4-0 win. “At the end we got tired and started playing boot ball,” says Linehan. The team returned to the pitch on Saturday to face Bayfield. Nerves were noticeable as Bayfield has been coming on in league play as a solid program, but the team was focused on putting together a more complete game. “We all knew that we dropped the intensity in the Cortez game so a lot of the players wanted to make sure that we got up on Bayfield and buried them,” says Linehan. It took the Titans 10 minutes again before striking on net as Gabi Marmolejo slipped a pass through to Josias Navarrete for the first goal. Three minutes later the Titans struck again as Marmolejo chipped a pass over the top to Chris Myers on the flank. Myers carried the ball to goal and sent it low into Dagan Schwartz who pushed it past the Bayfield keeper for a 2-0 lead. Franco converted on a penalty kick in the 29th minute and the Titans were up 3-0 at the half. 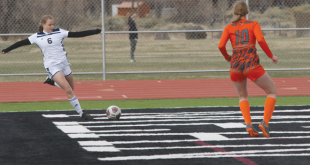 Crested Butte then stepped up their play in the second half to tack on five more goals, led by the exhaustive work of Reda and Young. They started it off five minutes into the second half as Young chipped a pass over the top to Marmolejo and Marmolejo attacked to push his shot near-post. Eight minutes later Miller assisted Franco on a goal, Hayden Faivre provided the next two assists as Schwartz completed the hat trick and then Franco set up Schwartz for his fourth goal of the game and an 8-0 win. “We moved the ball better so we weren’t quite as tired and still had some life left in us at the end,” says Linehan. The Titans now enter an insane part of their schedule as they have two games this week and then four games next week, including home games against Delta on Thursday, September 6, Cortez on Friday, September 7 and Bayfield on Saturday, September 8. “The keys to the next two weeks will be fitness, moving with and without the ball, letting the ball do the work and communication,” says Linehan.